Last week, I asked a neighbor far a ride to Blackstone Bicycle Works to deliver a used bicycle abandoned nearby. The Blackstone Bicycle Works was featured on a local news show, and I emailed them last month. After clearing their spam box I spoke with Chris, and set up a time to drop off the bike. When I arrived they gladly accepted my donation and offered a receipt for tax deduction. 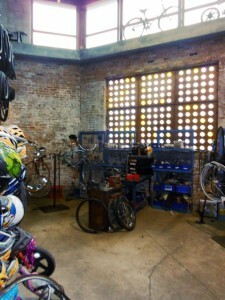 Blackstone Bicycle Works is a youth education program of the Experimental Station. In the context of a full-service bike shop dedicated to promoting ecological practices and empowering youth, Blackstone teaches mechanical skills, job skills, and business literacy to boys and girls from the under-served Woodlawn neighborhood and Chicago’s broader south side. This is a photo from their store, and the window “portals” are actually Ikea candle holders providing plenty of natural lighting and maintaining security. Their shop is located at 6100 S Blackstone surrounded by one way streets. They will take bikes in any condition, a donation dropped off at Blackstone neither has to be running nor even complete. They can pick up bicycles if it’s close by or there are multiple bikes or you can drop off during shop hours Tues-Sat 1PM-5PM. Visit the Blackstone Bicycle Works website for more information. Call 773.241.5458 or email blackstonebikes@gmail.com for further information or to schedule a pick-up. You can also support their program with a donation or purchasing a supporter T-shirt.